Radiology Today (RT) recently spent time with Don Rodden, CPA, CHBME, president of the Healthcare Billing and Management Association (HBMA) and a principal with HealthPro Medical Billing. In his role with the HBMA, Rodden is active in government relations work surrounding the implementation of ICD-10. RT: It’s been drilled into the heads of healthcare industry professionals that ICD-10 is coming in October 2013. Now the compliance date has been postponed. How should healthcare organizations handle this development? Rodden: Once CMS [the Centers for Medicare & Medicaid Services] announced that they were actually delaying compliance with ICD-10, our entire industry heaved a sigh of relief but also expressed a little bit of frustration. The Healthcare Billing and Management Association lobbied CMS 18 months ago, first trying to find out how firm they were with the compliance date, then asking for reaffirmation as to whether they were going to hold firm on the date. The industry had been through so many movable dates. At that point, CMS finally realized what they were doing to the market and began to firm up their dates for implementation deadlines. I’m disappointed that they didn’t hold firm on this date, although I clearly understand what they were facing. There were so many complications for the government, for CMS, and for commercial entities. To lay the groundwork for the changes to ICD-10, several changes needed to be made in the field sizes and a change to alphanumeric fields as well as background changes dealing with 5010 transaction standards. That transition was bulky and challenging. The industry spent hundreds of millions, if not billions, of dollars to reprogram and retool to accommodate the transactions that were anticipated by ICD-10. With that, specific groups throughout the United States have been dealing with delays in cash flow, a few of those being significant. After working through all those related issues with 5010 as well as listening to encouragement to reconsider the impact of ICD-10 implementation on the industry, CMS decided to hold off on the deadline. However, they did so without setting a definite date for implementation, which is creating a lot of additional confusion. RT: Should healthcare professionals proceed as if the deadlines for ICD-10 will not change and set their timetables accordingly? Or should they stop and wait to hear what happens next? Rodden: Since there is no way to know if the delay could be a few months or aggregated into a few years, I think there are a few specific steps that should be taken by those involved in radiology billing. First, everyone should continually educate themselves regarding ICD-10. As I have conversations throughout the industry, I’m finding that there are still a lot of people who have not done their initial homework and don’t actually understand all the downstream implications of ICD-10. Second, radiology groups should ask their facilities key questions regarding whether or not the hospitals and other organizations they work with are going to be able to capture the necessary information to make ICD-10 work. That ability clinically impacts radiologists because capturing the needed information helps the radiologist be more accurate and efficient with interpretation and supports the quality improvement process. RT: What specifically should radiologists examine to make sure their hospitals are ready to handle ICD-10? Rodden: Hospitals will need to have personnel who can gather detailed information from patients as they present at their facilities. According to the AMA [American Medical Association], moving from ICD-9 to ICD-10 will expand the diagnosis codes from about 14,000 to about 68,000. Under ICD-10, there is a significant increase in specificity. The nature of a patient’s injury doesn’t matter under today’s coding structure. Under ICD-10, if a patient was injured in an accident involving a railway train, there is a different code for the patient who is injured while boarding the train than for the patient who was injured while an occupant of the train. There’s also a different code for the patient injured in a fall from the train and even a different code for the patient who, while an occupant of the train, was injured due to an object falling from the train or falling on the train. If you back up and think about all the different ways a person can be injured with the specificity that ICD-10 carries, a hospital is going to have to capture all that data at an extraordinarily detailed level. Intake staff will have to know what details need to be secured from a patient. So the front-end information gathering of ICD-10 implementation is going to be extremely detailed. RT: Such detailed information clearly has a purpose other than diagnosing the problem and treating the patient, presumably some larger research or statistical purpose? Rodden: Yes, there are a number of purposes for gathering such detailed information, including research, quality measurement, and public health. One of the primary reasons is to be able to upload information to the World Health Organization databases so that other industrialized nations can receive it and so we can share their ICD-10 information. RT: While the accuracy of the information gathered has always been important for properly diagnosing patients, it looks like the quality of the information will carry even greater importance under ICD-10. Is that correct? Rodden: The quality of information once ICD-10 is in place will be incredible because it’s integrated with the reimbursement process. It’s going to be a very refined process, and every provider will want to get it right because it affects their reimbursement. I know of no other industrialized nation that uses ICD-10 for reimbursements, so I suspect that it’s much less relevant in their processes and systems. 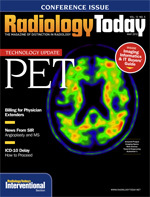 RT: With the concern regarding payment for claims, what questions should radiology organizations ask hospitals regarding their ICD-10 readiness, and what answers should they expect to hear? Rodden: First, I would ask the hospital to share their ICD-10 implementation plan. That would give me an opportunity to review it for its completeness and to see their timing for implementation. Because the process toward ICD-10 was already in motion for October 2013, the hospital should have already had a plan in place, complete with milestones. Gaining that information would enable me to evaluate whether or not the hospital is truly ready for the types of procedures that radiologists provide. My review would include looking closely at the ICD-10 codes [and] checking to see if a hospital and its system will be set up to gather the information that would support the underlying documentation to be able to code the procedures properly. In addition, I believe the ICD-10 implementation will go a lot easier if, within the hospital setting, radiologists continue to improve documentation. If we consider the underlying reasons why ICD-10 could break down, a major one will likely be that there has not been a lot of attention paid to ongoing process improvement. If the hospital system has great policies, procedures, workflow, and ongoing training for its personnel, ICD-10 training will go a lot easier. RT: How much will other components of the coding and billing process change with ICD-10? Rodden: The changes begin at registration, maybe even changes in the chronology of the registration process. Knowing how the registration process works, it’s going to be challenging to gather the information necessary to support the coding process, particularly as it relates to emergency procedures. Other healthcare providers, such as radiology technologists, will need to be included in the process to determine whether or not there is enough supporting information there for both the hospital and the radiologist to be able to bill. To some degree, from a clinical perspective, radiologists themselves are going to have to become aware of whether or not they have enough information to completely clinically determine the exam. Over time, this will become a standard of care, and they will be expected to know. RT: In the radiology setting, front-end staff and radiologic technologists must make sure they gather the information needed to code. So in the imaging setting, transition will not just be about reimbursement level. It will tie into the determination of whether this study is medically indicated. Is that true? Rodden: That is true. Today’s ICD-9 world asks a simpler question: What was the medical necessity for this exam? Tomorrow’s questions, under ICD-10, include medical necessity, purposes and cause, diagnosis, and outcomes. To document those requirements, the regulations outline four specific areas: diagnosis, reason for admission, conditions treated, and reason for consultation. RT: With the type of information that needs to be gathered to comply with ICD-10, it seems like the coding/billing bar is being raised for practice personnel. How should medical professionals handle that? Rodden: The expertise and subspecialization required within the billing process is going to expand dramatically. I think we’re moving toward a time where it will be helpful if there is greater clinical understanding aligned with the billing process. You should also use certified coders specific to radiology, such as the radiology coding certification through the RBMA [Radiology Business Management Association] as well as a broader coding expertise. In addition, knowledge of IT and electronic data interchange processes is essential. It’s becoming interrelated because of the connectivity between 5010 transactions and ICD-10. On the receipt side, managing the electronic remittance devices continues to take a higher caliber of person to accurately document the process. Finally, we’ve noticed that, over time, we need a much higher level of both coding and billing acumen in our claim area to effectively work those claims and get the yield that we should and that doctors deserve for the work they did. Many times, radiology groups think in terms of revenue. Legitimately, maximizing revenue is the goal with any good billing entity. However, increasingly moving from low to medium to high risk is the compliance arena. It’s not a matter of if you’ll get audited anymore; for some entities it’s a matter of when. Since the inception of the Medicare Recovery Audit Contractor Program, there are a variety of folks who are eager to find those errors. If they can identify those errors, even unintentional errors, and they are cumulative, then they can claim such things as fraud, and your services as a whole are increasingly being exposed to a lot more scrutiny. Your reputation and your quality control measures are published for individual groups. There is a risk associated with not having clinical and nonclinical expertise. I just can’t imagine people not outsourcing that core expertise five years from now. There is also a need for expertise when it comes to denied claims. There is value in working those denied claims. While it takes a lot more time and resources, a lot of revenue gets left on the table if they don’t get worked. RT: Does that suggest a pattern of some undercoding? Rodden: Actually, it often means that the claims should never have been denied in the first place. But it takes a lot more solid documentation to win in the review process for both Medicare and non-Medicare claims. It also takes a much higher caliber person in the field to analyze and write the necessary reviews to win the claim. RT: Circling back to what practices should do now, should medical professionals take whatever plan they had in place, keep moving forward, and then wait for the CMS to tell everyone what to do? Rodden: I can’t imagine any lost value in continuing with an existing implementation plan. The only risk is if Medicare defers implementation indefinitely or for a period of years. If the recently announced October 1, 2014, date holds, then there’s no harm in continuing with your existing implementation plan. With that, there is significant value in holding the course with your implementation plan and not being caught off guard. It takes one year to 18 months to prepare for ICD-10. It would be hard to cram for the final at the last minute on this test. Everyone needs to remember that this was mandated by law in 1996. So unless ICD-10 becomes legislated out of existence, it still needs to happen. In addition, everyone who touches any of these transactions electronically—hospitals, imaging centers, medical billing companies, claims clearinghouses, payers, and third-party administrators—have collectively spent hundreds of millions of dollars to prepare for this event. So I think it’s unlikely that it would be deferred a significant amount of time. RT: In summary, when sitting down with a radiologist owner, their administrator, and a hospital administrator, what are you telling them to do now? Rodden: First, I would want them to work with their facility administration to find out what the facility’s readiness is for ICD-10, then take any necessary steps from there. If I was a radiologist, I would want to make sure that all necessary information for billing is being captured by my coding staff or billing company and that all the denied claims are being worked. Even the most brilliant physicians don’t always receive proper business training and, therefore, are trusting of those who do. It’s great that those of us in the industry are trusted, but we need to be worthy of trust. Ultimately, practices still need to validate what should happen and take whatever necessary steps to confirm that they have certified coders actually coding all the interpretation reports and all the interpretation reports being captured by the system.